Coming back to Papua this time, after losing Paul four short months ago, was completely different than the other times we've returned to this place after being gone a while. I found myself wondering if I’d still have the joy that I’d had in the past, if fear would gain a foothold, and what would the team would be like without Paul's always-smiling, encouraging spirit. God, in His mercy, didn't make me wait long for answers. My first flight back in Papua was a pure gift. Another of our pilots, Mark Hoving, was given the task of flying with me to knock off eight months of accumulated rust from my flying skills. We set out from Sentani in the early morning with four passengers. Our first stop was the village of Dofu, a red dirt hillock sticking out of the vast swamp two hundred miles to our west. There, we dropped off two of our passengers: Jerrett and Courtney, two pilots from our team who were going to hop in a canoe and head downriver to the village of Wahuka to help Isolde, a fifty-something German widow-turned-missionary to the Kiri-Kiri people. After bidding the guys a safe trip, Mark and I piled back into the airplane with our two remaining passengers. Steve and Carolyn Crockett are returning to the Moi tribe in the X-Ray valley to teach the Moi believers the newly translated book of 1 Corinthians. Steve tells me the timing is perfect: the young Moi church is facing many of the same issues that faced the first century church in Corinth. On the ground in Daboto there's a warm reunion with Piato and the rest of the Moi. Among the crowd at the airplane are two patients. One, a pregnant woman who can barely walk, is doubled over in pain. Another is a young boy whose urine looks like pure blood (most likely a complication of malaria called blackwater fever). 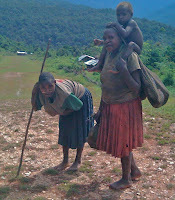 We fly these two to the coastal town of Nabire for medical help. Within the week, I’ve received word that they are both doing much better. While refueling in Nabire, we meet up with the next leg of today's mission: a team of Papuan pastors and a load of their supplies—they are heading to Dofu. As we review our pre-start checklists we hear the guys quietly praying in the back. These humble pastors made a trip last year to the Dofu area and upon witnessing the destitute conditions of the people living up and down the Mamberamo River system, they returned to the city and moved the hearts of churches across huge denominational boundaries to help alleviate some of the suffering they saw. Now, with over 1,000 lbs of supplies donated by these churches, they are returning to retrace their steps on the river to minister to the isolated peoples of the Mamberamo. To see such passion and commitment among Papuan pastors, sacrificially following Jesus on a very difficult mission, is humbling...and exhilarating. After saying our goodbyes to the pastors in Dofu, Mark is already in the airplane and I’m about to climb in, when a fellow comes running up to tell me that they've heard over the radio that there is a really sick man in the nearby village of Foitau—can we help him? Some quick math tells us we have the fuel and daylight to pull it off, and ten minutes later we’re landing in Foitau. An emaciated old man staggers to the airplane with his adult son. I help him up into a seat and as I grab his arms there is literally no muscle to be felt—through his dry, worn out skin my hand feels only the thin hard bone of his upper arm. I hope we're not too late. Landing back in Sentani, I’m realizing what a gift this first flight back in Papua is to me. It's as if God wanted to leave me no doubt as to why we're here. A couple of our pilots are now out in the steaming jungle helping a German widow reach the Kiri-Kiri people. The Moi believers are hearing 1 Corinthians for the first time. A pregnant woman, a sick little boy and a deathly ill old man are all getting the touch of much needed medical care. A group of national pastors is heading out into the wilds to minister physically and spiritually to some of the most isolated and forgotten people on the planet. And all of this on a single flight. I'd like to think that we've followed Jesus to this place regardless of whether we see 'fruit' in the ministry...so to see Him work so clearly, in a single day, through a team of deeply flawed missionary aviators and their extremely limited resources, is simply a gift from God that fans our passion for being here.